This ancient city is mentioned in the Quran, where it's noted, "for the natives of Sheba, there was indeed a sign in their dwelling-place, a garden on their left and a garden on their right. "We said to them, 'Eat of what your lord has given you and render thanks to Him. Pleasant is your land and forgiving is your lord." Farmers were watering their farms for five complete days. The dam was the wonder of the city though historians spoke differently about the time when it was built, and about the builder. Some says it was Sheba dhu Yashjub. ViewZone's Expedition [left] caught this image of the ruins of Old Mareb. 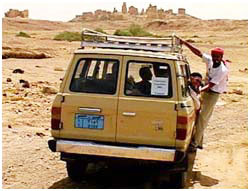 The ancient city is now surrounded by a harsh desert and is virtually uninhabited. It was built with stones to hold rainwater and remained for a long time. But people were proud of their power and became tyrants, so God destroyed them and their dam. In his book "Green Yemen, The Cradle of Civilizations," Mohammed bin Ali Al-Hawli notes, "the explosion of the Mareb dam left a deep mark on the Yemenis and Arab peninsula, and was considered as a great calamity that changed the political and natural history of "the green". As a result, tribes migrated to different territories. The Quran adds, "lord, make our journeys longer. They sinned against their souls. So we made their fate by sword, and scattered them throughout the land. Surely, there is a sign in this for every stead fast, thankful man! (Surah 34:19). They dwelt in Mesopotamia and Syria where they established the kingdoms of Hira and Ghassan. Gorhom, the tribe, and settled also in Meccan, where they became custodians of the sacred house until Qusei slo Kilab, Mohammed's grandfather took custody. Aws and Khezrej settled in Yathrib and later supported the prophet after migration.